"I've lost my mum! "It's not too much fun being lost in the jungle, and little monkey wants his mummy. A kindly butterfly is keen to help, but they don't seem to be having much luck as the well-meaning butterfly misunderstands monkey's descriptions and leads him to all sorts of unsuitable animals! But eventually, they find... Dad! 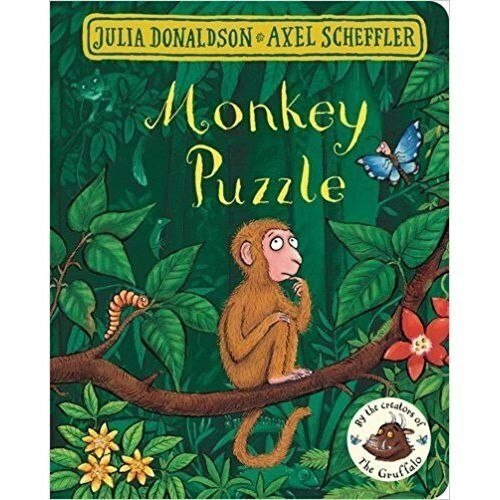 It's just as well that he knows exactly where mum is, and she's waiting with a well-deserved cuddle.Monkey Puzzle is a clever, funny and charming tale from the unparalleled picture-book partnership of Julia Donaldson and Axel Scheffler, creators of The Gruffalo. This handy board book format is perfect for younger readers. It features the classic story with a stunning redesigned cover and beautiful finish, making it a must-have for even the smallest Donaldson and Scheffler fans! Also available in board book format and with striking redesigned covers are: The Gruffalo, The Gruffalo's Child, Room on the Broom, The Snail and the Whale, The Smartest Giant in Town, Charlie Cook's Favourite Book, and A Squash and a Squeeze.